A Chicago-based animal care expert is playing a key role in an unprecedented effort to save more than 10,000 critically endangered tortoises that were found in squalid conditions in an abandoned home off the southeast coast of Africa. Shedd Aquarium veterinarian Dr. Matt O’Connor has been in Madagascar since last week evaluating and treating many of the radiated tortoises, a species native to the island’s unique spiny forests that is prized for the striking yellow star pattern found on its dark, high-domed shell. On April 10, police in Madagascar discovered the reptiles spread across nearly every inch of dirt-covered floor inside a two-story house, with no access to food or water. Several hundred of the tortoises were found dead or dying from dehydration, malnutrition and illness. Wildlife experts suspect that the tortoises were confiscated for the illegal pet trade and had been living in the house for weeks. Local police, along with Madagascar’s conservation law enforcement agency, are continuing to investigate, according to Shedd. The confiscated tortoises could comprise up to half of the species’ surviving population, said Dr. Bill Van Bonn, Shedd’s vice president of animal health. Biologists estimate that over the past 30 years, once-abundant tortoise populations have declined by 80 percent due to illegal wildlife trafficking, putting the reptiles on the path to functional extinction within two decades. Van Bonn said the surviving tortoises are in good hands with O’Connor, however. Although he oversees the care of all 32,000 animals at Shedd, O’Connor is particularly interested in turtles, tortoises and amphibians. In 2015, O’Connor helped care for 4,000 confiscated turtles found in a shipping container in the Philippines. 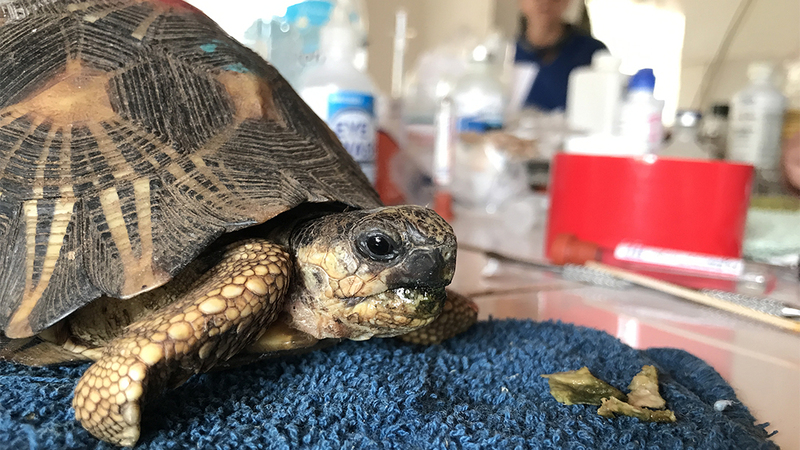 In Madagascar, O’Connor is among the first wave of veterinarians, technicians and tortoise keepers who have been deployed from more than 20 institutions worldwide in what Van Bonn said is a first-of-its-kind rescue mission because of its scale. O’Connor and other respondents are based at Villages des Tortues, a 17-acre private wildlife facility in Ifaty, on the southwest coast of Madagascar. The effort, coordinated by the global Turtle Survival Alliance, has involved days of nonstop evaluation, hydration, triage and relocation to a private wildlife facility, according to Shedd. Van Bonn said the alliance was already caring for 8,000 tortoises in Madagascar, only to see its inventory of patients more than double overnight upon discovery of the 10,000-plus confiscated tortoises. O’Connor reported that many of the tortoises are thin and lethargic. Some have eye issues, while others have painful lesions on their tongues and in their mouths. Because the possibility of continued poaching remains high, their future is unknown, Van Bonn said. The decision of what to do with the tortoises will ultimately be made by the government of Madagascar. “Unfortunately, it sounds like a fair number of them will not be introduced to the wild and will need to be maintained as a source to try to get populations that can reproduce,” he said. O’Connor is scheduled to remain on the island until May 18, and Shedd is considering whether to send additional staff and supplies to assist the triage effort, which could take months or longer. Radiated tortoises are not found at Shedd, but the aquarium is home to a number of South American tortoises.